Support your legs, free your toes and experience an energising circulation boost and better recovery from runs or exertion. These ‘Zoe’ ToeSox Compression Full Toe Knee High Socks with their five separate toe pockets allow and encourage you to spread your toes, strengthening foot muscles and increasing stability. 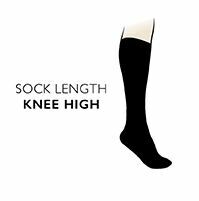 ToeSox Compression Full Toe Knee High Socks have a defined heel cup and seamless five toe construction for comfortable fit, a built-in arch band for support and a secure dual welt band for a snug, secure fit. "Graduated compression leg; vector heel cup; vented knit for faster cool and moisture release; arch support band "